Glo is lifestyle accessory & fitness companion for older adults. The nature of the product infuses dynamism in their lives, increases social and community engagement and improves physical and emotional well-being by motivating them to stay mobile and active. Learnings: Although the idea worked conceptually , we realized that executing it; to create a shoe prototype that automatically balances the person would require engineering expertise beyond our current skill-set. Also, we found out that some similar ideas like this were being explored (at the time we were working on this project). Variation in color saturation act as motivators for older adults to move and stay active. Developed in collaboration with Emily, Matt and Marcelo as a part of Future Wearables course, Glo is a low-tech fitness companion to empower mobility among older adults at personal level and enhance social interactions in the neighborhood. Older adults want products or services that are functional yet not too obtrusive. People presume older adults have nothing to give, but they can help too and are willing to help. Fear of Falling is the biggest fear older adults develop and that hinders them from moving around and engaging in the society. They care for their belongings and seek for a companion that they grow with. 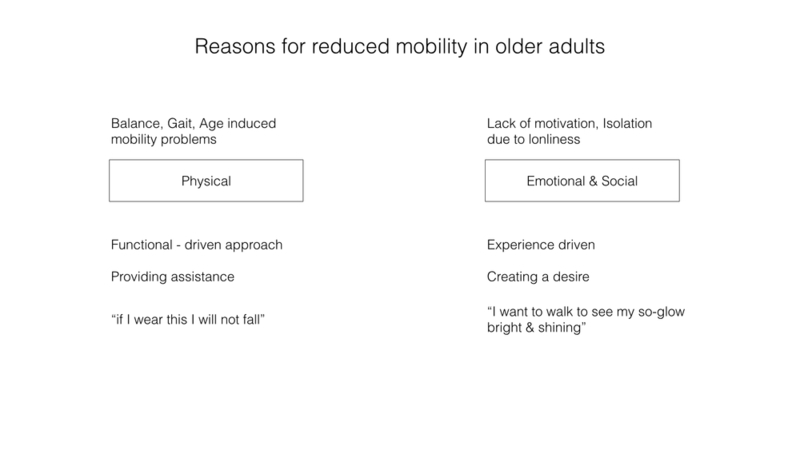 With these insights we set out with a goal to design a solution that empowers mobility among older adults. 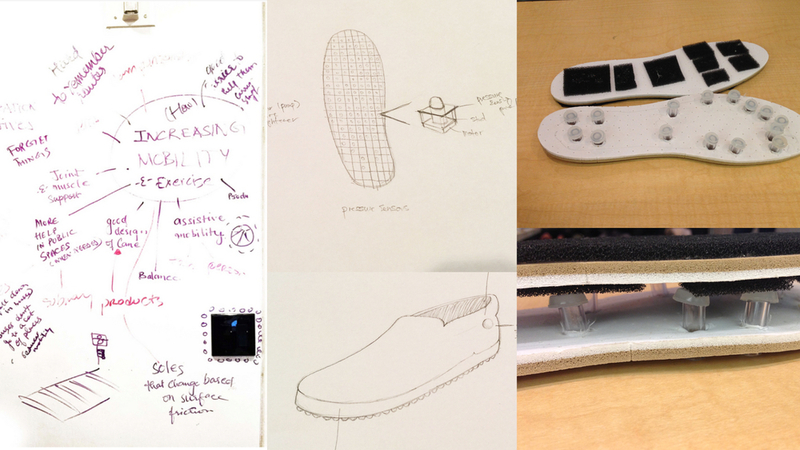 Our first approach was primarily functional - design a wearable (shoe) that improves balance. This was based on our research finding - aging leads to reduced vision and pressure sensitivity causing delay in response to any physical hinderance that older adults encounter while walking. This leads to higher chances of fall in older adults. 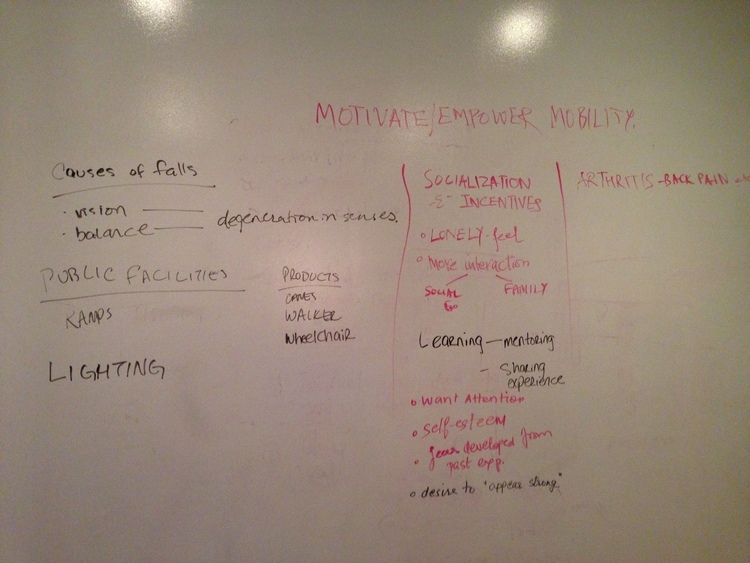 With the learnings from concept -1 , we went back to user research and got deeper into the causes of reduced mobility in this target group. We found out that one of the underlying reasons for reduced mobility is the lack of motivation and isolation due to loneliness. This led us to explore the second design direction focussing on emotion (loneliness) and engagement. Our second concept aimed to create a desire to move in older adults by creating a mutual associations with them as a fitness companion. Glo is designed around the inherent nature of older adults to take care of their belongings. The nature of the product infuses dynamism in their lives, increases community engagement and improves physical and emotional well-being by motivating them to stay active. Glo is a lifestyle accessory (a polygonal sphere, that can be used as a bracelet/ necklace) that glows brighter as you walk or move. When you stop moving and time passes by, the saturation of the glow will fade but it will never turn off. Unlike, other fitness trackers, Glo does not count your steps but tracks how long you've been mobile and displays it as "brightness/ saturated color". There is no interface, the interaction is simple, easy to use and understand. Social Glo - To promote community engagement Glo has an intelligent algorithm that changes it's color every time it comes in proximity with another user with Glo for a stipulated duration. Both the user get the same color, which acts as a short and sweet memory between the old adults.